I had seen the invitation. I knew the unveiling was going to happen. I had my speech prepared. I knew it was going to be an emotional event, but I was bracing myself. Still, as soon as I walked into Bengal Boi (my first time ever being there), I stopped in my tracks as the first thing I saw was a poster of my brother. His smiling face was right in front of me, greeting me. I wanted to run over to him and hug him — but it was a just a poster. For a moment I wondered – what have I gotten myself in to? Why am I here? Why would I voluntarily put myself in this position of having to talk about my brother in front of people I didn’t know? How did it happen that we are here to donate his prized possessions. What am I doing? 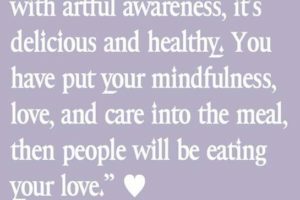 Once I caught my breath, I thought – ok, that’s nice. They’ve really made an effort and put up this poster letting people know that a special event was going to happen. Then we were led to the courtyard. I wish I had been warned. To the right there were several chairs, all lined up and ready for people who would be coming for the opening. To the left — in front of all those chairs — was an enormous banner with my brother’s face right there. Yes, it was beautiful. So very beautiful. But my goodness, did I have a mix of emotions rush through me in that moment. I love him, but it pains me to see his face. We had arrived early so we took the opportunity to explore Bengal Boi as we had never been there before. The place was buzzing. 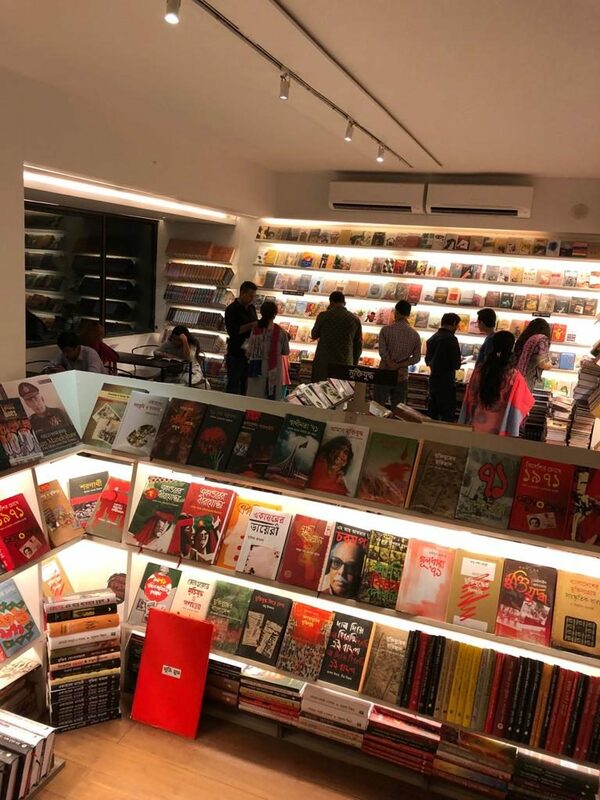 I thought the place was just going to be a small store that had a few shelves of books. I was wrong. 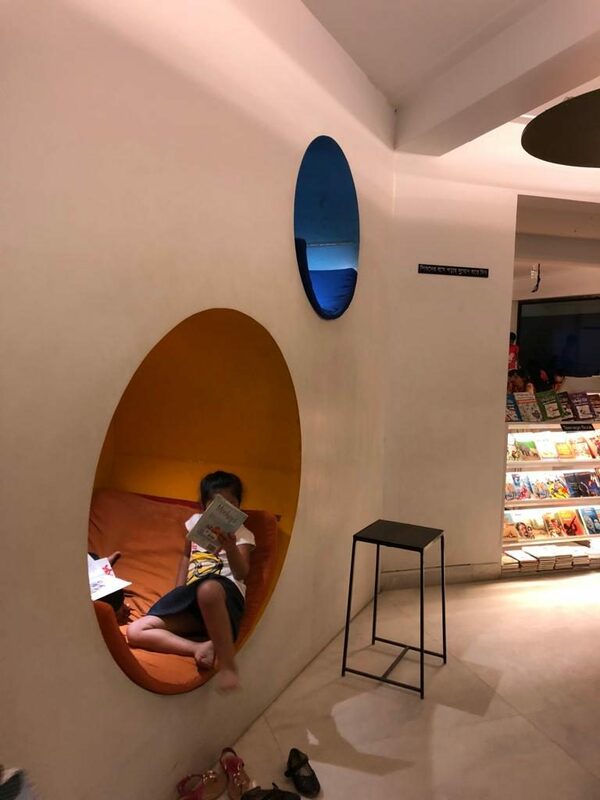 There were three floors, each with little nooks and crannies filled with books and places to lounge and read. 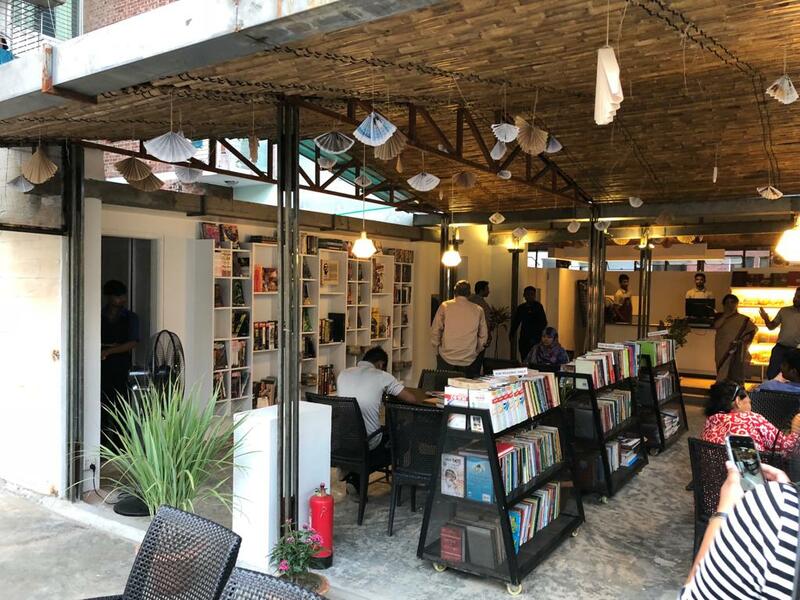 There was a lovely outdoor cafe on the ground floor and a smaller cafe on the 3rd floor, which is also where Ahmed’s corner has been constructed. Ahmed’s corner has been named Comic Cache. 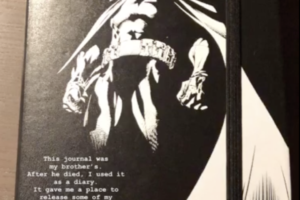 It features most of his collection of comics, graphic novels, and book. 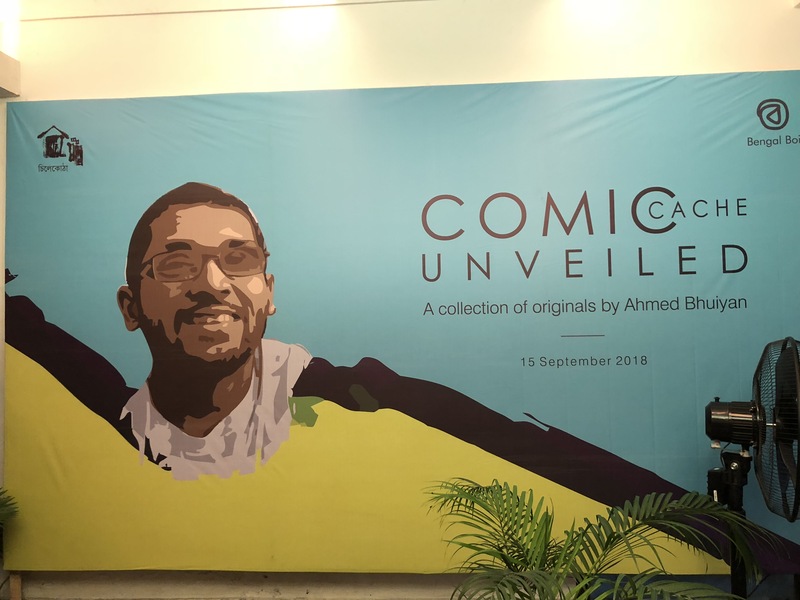 I had only expected a handful of people to be there and a token gesture to open Ahmed’s corner. Instead, what we saw were about a hundred people – friends, family, and members of the community – who came to remember Ahmed. 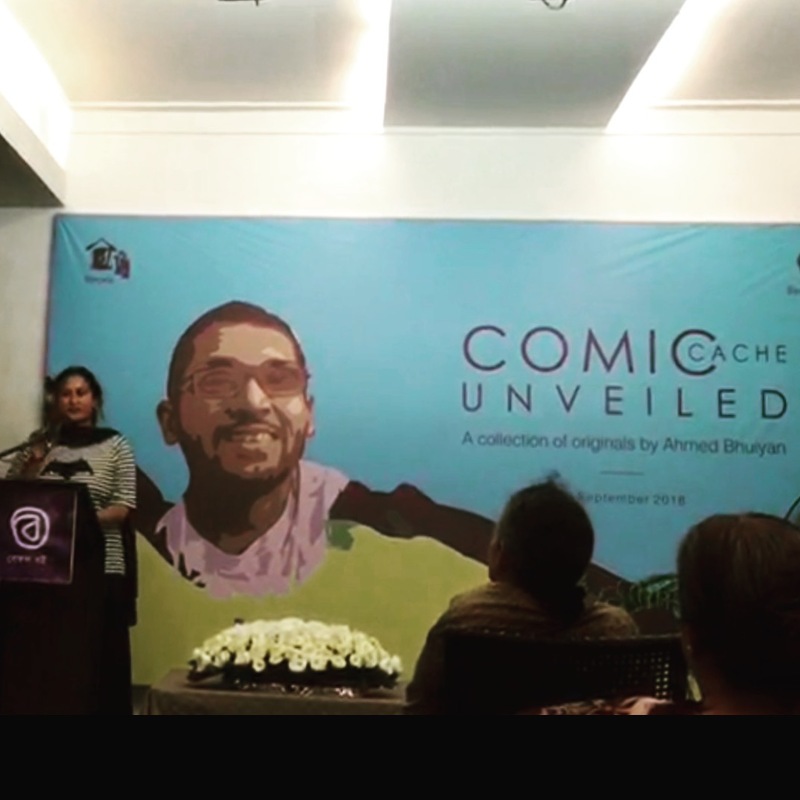 I had been asked beforehand to say a few words about my brother, but what surprised me was other well known people in Bangladesh’s literary circle were going to speak about him as well. 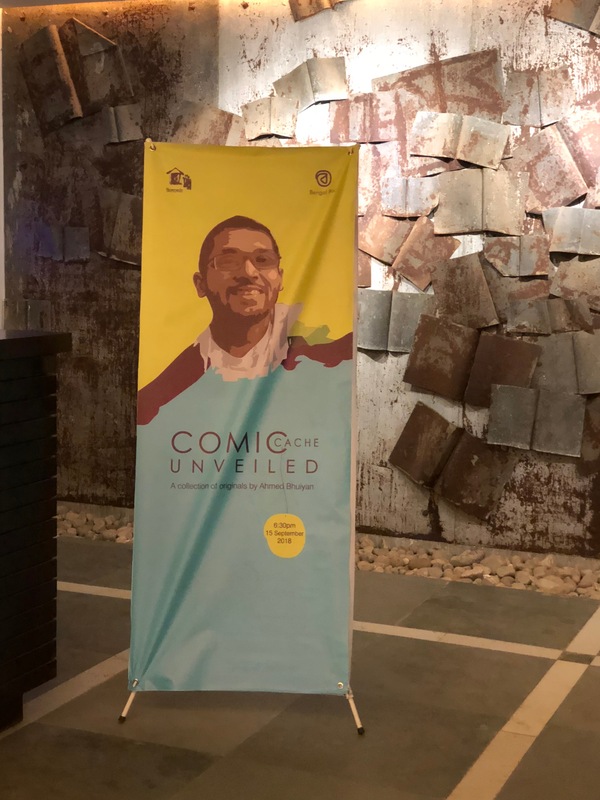 Among them were Ahsan Habib, editor of Unmad, Zamil, owner of Zamil Comics (where Ahmed bought hundreds and hundreds of comics and graphic novels), and Kazi Ashraf, the director general of the Bengal Institute. 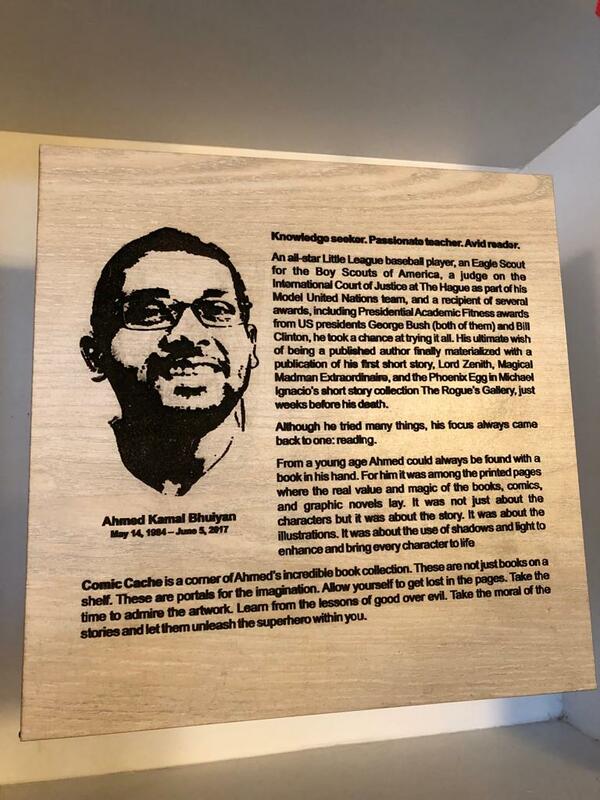 It was heartbreaking yet touching to hear people talk about Ahmed’s warmth, intelligence, and character. 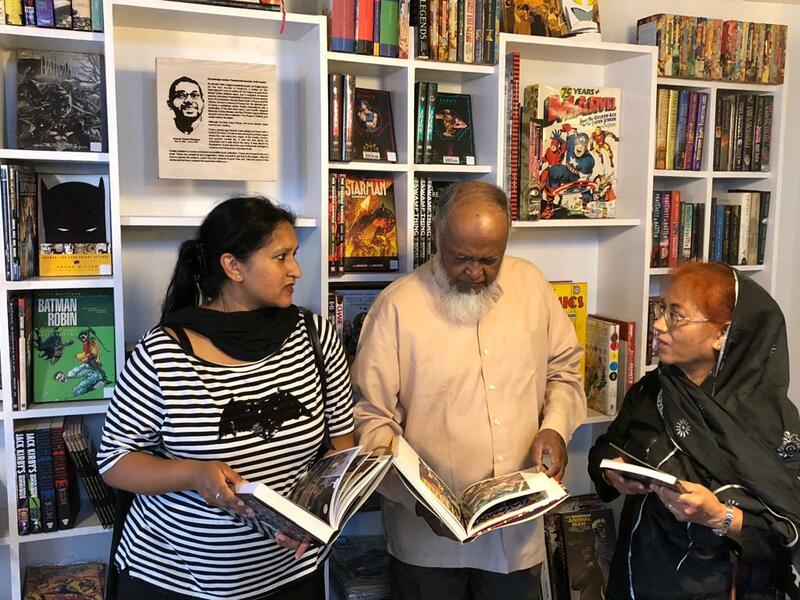 We really are appreciative to Luva Chowdhury, Director General of the Bengal Foundation, for organizing this wonderful event and for taking care of Ahmed’s books. 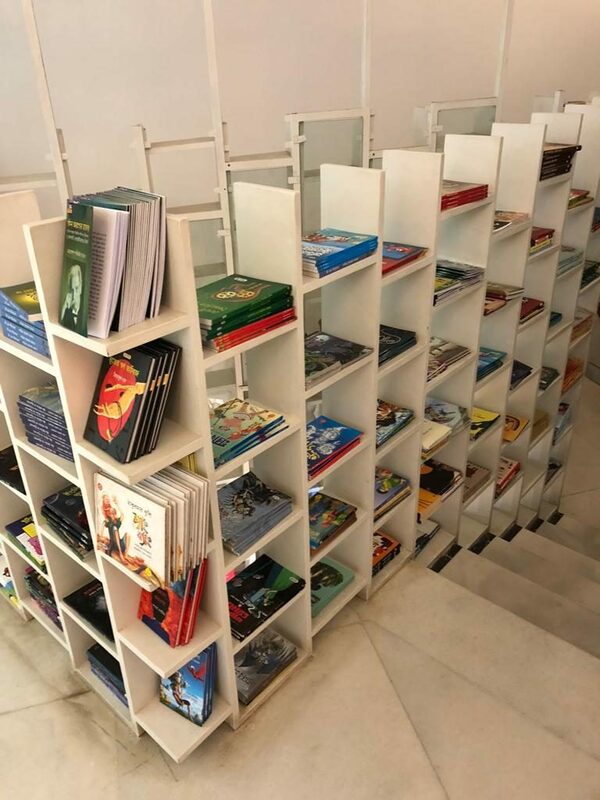 The corner will be accessible by special membership only so as to ensure the care and security of the comics and novels.